Soft focus effects are common in fashion and advertising images, but are not widely used for landscape photography. The landscape photographer is usually aiming to capture the sharpest possible image with the greatest depth of field, and using a soft focus filter would normally be counterintuitive. A soft focus treatment of a landscape can enhance the mood of an image by creating a soft glowing atmosphere, and can be particularly effective for backlit subjects. Soft focus is not the same as out of focus, and is not about degrading the image, but rather about subtly changing the image to convey a desired interpretation to the viewer. The key to a successful soft focus image is to maintain a sharp rendition of the subject while adding a supplementary softer image. Traditionally with film this is achieved by use of patterned glass or plastic filters, by stretching a fine mesh over the lens, or less controllably, by breathing on the lens. These methods all work by allowing most of the light entering the lens to pass straight to the film while diffracting a small amount of light to give the desired effect. 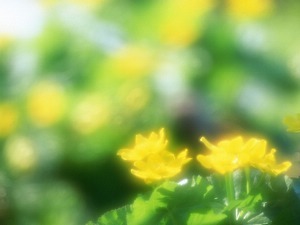 Of course this means that the decision to use a soft focus effect must be taken at the time the photograph is taken; with digital manipulation we have the luxury to apply a soft focus interpretation at any time, and to have much greater control than is possible using filtration with film. As with most digital imaging manipulations there are several ways of achieving soft focus. The simplest and most direct method in Photoshop is to use a blurring filter (typically gaussian blur) and then fade the filter using a low opacity and an appropriate blending mode. However, because this process works directly on the image it is tedious to fine tune and cannot be altered after saving the image. A much better approach is to use overlays to create soft focus without modifying the underlying image. The examples below show the results of three different methods of applying soft focus through the use of overlays.